Save energy and space with our Collapsible Drying Rack. 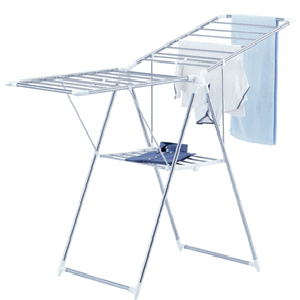 This is a great drying rack for all seasons - perfect for the mud room in winter and pool area in summer! Chrome finish will not rust or chip and drying rack collapses easily for out of the way storage when not in use! Extra shelf on bottom is perfect for fine washables or sweater drying.